Roborovski hamsters are cute beyond belief, the Roborovski hamster is the smallest at around 2 inches long, and fastest hamster species of them all. Roborovski hamsters have reasonably short hair, which is a blond, like a sandy color, this is useful as camouflage in their natural desert environment. These little things are not easily tamed, but who cares, you can watch them for hours climbing, and digging their tunnels. They have poor eye sight like most nocturnal animals, and are most active at around 12.00 at night, but they wake up often during the day to eat food. 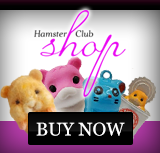 Robo hamsters usually live in social groups of up to 20 in a burrow, where they breed, and collect a large food store for over the winter, using their food pouches to carry food across large distances. 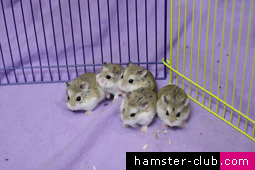 If you have this hamster as a pet it is best to buy them in a group of 2-3 females, confined males will fight each other, and can kill each other in the process, so female sisters are better, although do not forget that around the breeding season usually around April to June, even female sisters will fight due to unsuccessful matings. This is usually harmless, but be careful to keep an eye on them, as accidents can involve broken legs, and chunks of missing fur. Like other hamsters they like to chew things like material, and carpet, they are usually trying to make bedding, do don't let them alone with your clothes. 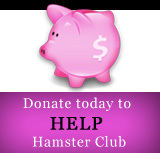 They like to dig, so make sure the sawdust in their cage is thicker than you would usually lay down for a hamster. Roborovski hamsters are escape artists in my experience, because they are so small they can squeeze through small gaps. I lost one of mine under the bath on three separate occasions, I just put the cage in the bathroom, and it eventually went back in for the food. Roborovski hamsters together are so loving to each other, they sleep together, collect food together, even run in their wheel together, that I would never buy one on its own. They make wonderful pets, but possibly not very suitable for children who want an animal to cuddle, they are just too fast.